What are Truth and Reconciliation Commissions (TRCs)? Over the past three decades, truth and reconciliation commissions (TRCs) have been established in times when courts are unable to confront past violence and places where the scale of harm dwarfs the capacity of traditional punitive models. Diverse histories of violence, including the Liberian civil war, the Indonesian occupation of Timor-Leste, South African apartheid, and the Indian Ocean slave trade, have passed under the TRC microscope. TRCs are based on the premise that investigating historical violence (seeking the truth) can be done in such a way as to clear the path toward healing (reconciliation). Provision for reparations have come to be a standard part of TRCs as ‘victim-centered’ processes. As extra-judicial instruments, TRCs recognize the inadequacy of punitive criminal justice in dealing with the violence reverberating within our modern world. And yet, TRCs have historically been established as “transitional justice” instruments, that is, as part of a neoliberal democracy-building framework that pursues versions of stability and peace as defined by the UN and related power centers in the international order. TRCs attempts to move beyond criminal justice have conventionally been quarantined to “other” nations, countries in the Global South. Thus the TRC’s efforts to push beyond the insufficiency and violence of punitive criminal justice remains quarantined in a Eurocentric framework: it may be good for those other places, but not for us. In the past decade, communities in wealthier nations have begun to embrace and apply the TRC as a way to confront historical injustice. The Maine Wabanaki-State Child Welfare TRC (2012) and the TRC of Canada (2008), both focused on violence against indigenous/ First Nations populations. The Greensboro TRC (2004) and the Alachua County TRC (2018) focus on racialized violence against African American populations in the US. These, among others, speak to this ongoing effort to wrest the TRC from the transitional justice framework and apply it within a more robust historical justice movement. What was the Ghana National Reconciliation Commission (2001 – 2004)? In 2001, the Ghanaian government established the National Reconciliation Commission (NRC) on the heels of the first electoral regime in Ghana’s national history. Political negotiation led to an expansive mandate. All the years from national independence in 1957 until the democratic constitution of 1992 were up for review, and the NRC used a broad definition of “state-sanctioned human rights violations” as its mission. Approximately 4,300 Ghanaians out of a country of 20 million came forward with stories of violence. A proportion of these were invited to testify at the public hearings, also held in different regions throughout Ghana and widely publicized by the media. Consequently, the NRC Commissioners penned a final Report reflecting on the process and making recommendations for reparations. By 2007 approximately 2000 Ghanaians received reparations payments ranging from $217 to $3,300 based on the abuse that they suffered. This reparations program was seen as largely unsatisfactory by the participants in the NRC, and was by many accounts with self-described victims, a source of bitterness. The reparations program that the Ghana government implemented diverged from the reparations program in the Commissioners’ Report. Likewise, the Commissioners’ recommendations for reparations also did not match the shifts that survivors of violence publicly longed for in their petitions and testimonies. Lesson # 1: Reparations programs developed as part of global TRCs have often been paltry, focused solely on small sums of money or other token gestures—and divorced from what survivors actually ask for. These anemic programs then shore up the perception that reparations “cannot work” or “can never be enough” or “are not worth fighting for.” Reparations program must center the survivors of violence as experts– not only seeking their testimony, but also in the design and implementation of the reparations program. Lesson #2: Survivors will have different priorities and demands in the pursuit of healing after state violence. Reparations program must account for the diversity of desire among survivor communities/. Lesson #3: Pursuing transformative justice through reparations cannot occur solely with the delivery of particular goods to victimized communities. Without also addressing the transformation of the surrounding perpetrator society, reparations programs risk leaving the vectors of harm intact. Moses Chrispus Okello et al., Where Law Meets Reality: Forging African Transitional Justice (Pambazuka Press, 2012). Author Abena Ampofoa AsarePosted on March 22, 2019 Leave a comment on For the Salon….. This week my article “Pursuing the Horizon of Abolition,” was published in the International Journal of Crime, Social Justice and Democracy. Within, I argue that African countries are not just places afflicted by the global incarceration imperative, they may also be sites from which to chant it down. It is serendipity that this article was released just a few days before Ghana’s 62nd anniversary; its subject is the unfinished business of national independence in Ghana — specifically where prison reform and penal abolition fit into this ongoing project of African freedom. This article is inspired by the amazing work being done by award-winning Ghanaian journalist Seth Kwame Boateng of JoyFM—- specifically two powerful documentaries about Ghana’ prison overcrowding crisis. The links to Locked and Forgotten (2015) and Left to Rot (2016) are posted below: please take the time to watch, follow Seth Kwame Boateng, and support his ongoing work. All interpretations, readings, and errors in the article are mine and mine alone. I am so honored that Truth Without Reconciliation has been named a 2018 Outstanding Academic Title by the American Library Association Choice magazine. “Every year in the January issue, in print and online, Choice publishes a list of Outstanding Academic Titles that were reviewed during the previous calendar year. This prestigious list reflects the best in scholarly titles reviewed by Choice and brings with it the extraordinary recognition of the academic library community. The list is quite selective: it contains approximately ten percent of some 6,000 works reviewed in Choice each year. Choice editors base their selections on the reviewer’s evaluation of the work, the editor’s knowledge of the field, and the reviewer’s record. The Choice Reviews feature on Truth Without Reconciliation is found in the December 2018 issue. “This fascinating work explores the thousands of testimonies collected by the truth and reconciliation commission (TRC) in Ghana in 2003 and 2004. Asare (Africana studies, Stony Brook Univ.) critiques the limitations of the reconciliation framework that gained popularity after the South African TRC of the 1990s. Rather than simply deflate the pretensions of individual testimony and national healing, however, this study takes on the challenging task of constructing narratives from the widely divergent collection of statements by victims of political violence since Ghanaian independence in 1957. This allows Asare to explore how ordinary Ghanaians, soldiers, and civil servants negotiated with political authorities. Ghanaians appropriated human rights rhetoric not to support a general notion of national unity. Instead, they raised a wide range of individual concerns about matters ranging from the ways soldiers targeted female traders as traitors to the nation to the ambiguous position of the military itself, since many soldiers became victims of military regimes. Deftly drawing from a broad range of critical theoretical approaches, Asare’s study is a model for its methodology and organization. Truth without Reconciliation should be required reading for anyone interested in national reconciliation programs. I wrote a blog post for the Penn Press Log about the potential of a U.S. truth and reconciliation commission. Today, we have a guest post from Abena Ampofoa Asare, who teaches Africana studies and history at Stony Brook University and is author of the new book Truth Without Reconciliation: A Human Rights History of Ghana. In this post, Asare draws upon her research to examine the relevance of calls for a truth and reconciliation commission in the United States today. Read more at the Penn Press Log here. Author Abena Ampofoa AsarePosted on September 13, 2018 Leave a comment on Is it Time for a U.S. Truth and Reconciliation Commission? School segregation is deepening on Long Island. Although the 118-mile stretch east of New York City has come a long way from its mid-twentieth century identity as the White suburban prototype, Long Island’s diversifying population is not leading to more integrated schools. This is the story of my family’s attempt to escape the norm of separate and unequal in L.I. schools—and why we were unsuccessful. Segregation, in the minds of many Americans today, is quarantined to apartheid South Africa or Jim Crow Mississippi. We do not think of segregation as the distance between Smithtown Central School District which is 89% White and Central Islip Union Free School District that is less than 10 miles away and is 92% Black and Hispanic. We may pass our eyes over this stark difference without understanding why it matters. Lily-White schools with abundant resources in this diverse region means that somewhere else on the Island (usually not too far away) there is a warped photonegative: a majority Black and Brown school contending with concentrated poverty and lesser resources. Long Island’s diversity is steadily increasing. Families from all parts of the world now claim Long Island as home. Since the 1980s, all net population gains have come from immigrants. Today a third of Long Islanders are people of color and in less than fifteen years, persons identified as white will be just one of the many groups in the region’s demographic profile: they will no longer be the racial majority. And yet, more than two-thirds (67%) of Long Island children attend segregated public schools. Most White children on Long Island learn in majority White classrooms and most Black or Latino children attend schools with mostly other Black and Hispanic children. Only 21% of Long Island students have the opportunity to learn in integrated schools where the student body represents the region —and these numbers are dropping. Long Island is a cautionary tale for the rest of the country: demographic shifts do not automatically translate into democratic opportunity. I am the parent of a future Long Island kindergartener. I am also a Black woman and a professor at Stony Brook University. In the past year my family has collided headfirst with this region’s history of segregation. In these parts, school integration is a fantasy; the boundary lines of public school districts enshrine the apartheid principle of separate and unequal. For example, in the academically successful elementary school about one mile from my office, only 4 of the 623 students are identified as Black or African American; only 8% of the families qualify for reduced or free lunch. Less than 15 miles away, in the Brentwood School district, a full 80% of the students qualify for free/reduced lunch and the vast majority are Hispanic. What would it take for our family to bypass these patterns of exclusion and separation? How could we support our child’s healthy emotional development and live our values around public education? We decided to look beyond our highly-praised local public school. After all, high test scores are not a proxy for teacher dedication or children’s potential. About twenty miles away we found a public school with great principal, dedicated teachers, and an exciting dual language immersion program. Here, our son would have an opportunity that is increasingly rare in Long Island: to learn alongside children of different racial and economic backgrounds. However, we quickly met with roadblocks in our attempts to use economic and racial integration as a metric of school excellence. In a place where segregated public school districts are the norm, disrupting this pattern is more difficult than you might imagine. We could not give up our place in the local school district and enroll in another public school district without paying significant fees (approximately $15,000/year) in addition to regular property taxes. Moreover, enrolling out of district would require the express approval of the school board of our preferred district. If I could somehow afford these fees and win over the school board, neither district was required to provide transportation. In our case, the integrated school district did not have a clear process to approve out of district applicants, the out of district fees were high, and with full-time jobs and no busing we could not ensure our son safe passage to school every day. I discovered that there are no mechanisms supporting Long Island families—apart from moving to one of the few diverse school districts (there are 18 out of 125 total)— to choose a non-segregated public education. In these parts, property taxes are king; their edict is unquestionable and undisputed. Well-resourced families feel they have “bought” or “earned” excellent schools without blanching at the Darwinian logic that apportions out quality education to five year olds based on their parent’s economic location, which in turn is more often than not determined by their grandparents’ prosperity. Our comfort with economic exclusion has bred public schools that preserve and multiply historical inequality; our educational institutions function as walls between kids from poorer families and kids from wealthier families. Over fifty years ago when Rev. Dr. Martin Luther King, Jr. spoke of his much-lauded dream, he envisioned an integrated childhood as a vehicle for national racial redemption. “One day right there in [the] Alabama [of] vicious racists” Dr. King prophesied, “little black boys and black girls will be able to join hands with little white boys and white girls as sisters and brothers.” However, half a century later, although US civil rights law established school integration as a federal and cultural goal, many Americans today neither know what an integrated school is or understand why it is valuable. Many of us would not even recognize an integrated school if we saw it. In the past six months, I have found that many in my community are confused or indignant when I lament our wealthy and segregated schools. After all, their child has one Black friend or two Asian friends! After all, that child seems very happy in the school! After all, my family is living in the neighborhood! How dare I suggest that our schools are segregated? Content to believe that segregation is a matter of a formation of letters above a water fountain, we grasp at the presence of one Black children in a kindergarten class of 50 as sufficient evidence that we, too, are living into Dr. King’s dream. Moreover, we misunderstand integration as a matter of social enrichment when it is primarily a vehicle for equality of access and opportunity. Yes, research shows that all students benefit socially from integrated classrooms. And of course, school is a uniquely appropriate setting to provide students with the emotional and intellectual tools to navigate a diverse and complex world. However integrated schools do more than grow compassionate and tolerant human beings: they are necessary if this country hopes to pivot toward a functioning democracy. For poor children of all backgrounds, attending a strong, well-resourced public school—which usually is an integrated school— is the single clearest path to a future of opportunity. There has never been a moment in the history of this country, education journalist Nikole Hannah-Jones explains, where Black people who are isolated from White people have gotten the same resources. The presence of White children has, in the past and present, been correlated with the consolidation of economic and cultural resources needed for strong public education. This is not because families of color care less about education. On the contrary, in a country where racial identity has been a proxy for citizenship, persons marked as White have historically had greater access to wealth and resources because they have enjoyed full citizenship rights. Fighting for school integration today is a way to ensure that the cultural and economic resources that have accompanied full citizenship are not hoarded within white communities. When Melba Moore Beals and her eight compatriots put themselves on the front lines at Little Rock’s Central High, they fought to establish the right to an equal education regardless of identity. Today, we praise the Little Rock Nine and just the same, continue to send scores of brilliant American children to separate and unequal schools. 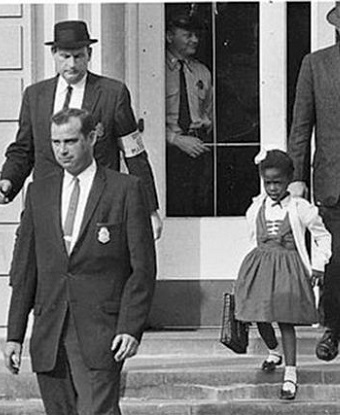 We do violence to the courage of little Ruby Bridges in her starched pinafore by insisting that segregation is over because a few wealthy families of color can avoid under-resourced schools. In diverse Long Island, our segregated schools are not an inevitability but a choice. However, it is folly to think that individual families can “choose” integration or fight the battle for equality on their own. Erase Racism, a local think-tank, suggests that one solution to Long Island’s school segregation problem is to redraw school districts along town and city lines. Instead of 125 tiny, separate, and unequal school districts, there would be 15 districts, none of which would have an overwhelming number of poor students and all of which would represent the demographic range of the island as a whole. Anti-racist parents and teachers across the region must come together and wrestle with ideas about how to ensure that quality education and integration for all our children is on the agenda. In the meantime, in Suffolk County where I live, there are a handful of integrated school districts. These districts should be visited, championed, and supported by all parents and educators who are committed to racial justice. Albany should ensure that integrated districts that are taking on the challenge and privilege of teaching all students and modeling a truly public education are well-resourced and thriving. Families like mine who live in well-resourced and segregated districts must begin to ask the hard questions: Why, in 2018, in a diverse Long Island, are our children attending schools that are overwhelmingly segregated and unequal? What are the consequences of raising children in segregated schools and then expecting them to function as good citizens? How can we extend the fierce love we have for our own families outward? This post was originally written for “The Devil’s Tale: Dispatches from the David M. Rubenstein Rare Book and Manuscript Library” on February 26, 2016.